« 1989’s Contested Legacies », colloque à l’Université de Varsovie en septembre 2019. Les propositions de communication sont attendues pour le 30 avril. Dates et Lieux : 28-29 novembre 2014 – Aula Magna ELTE ÁJK, Egyetem tér 1. puis Musée Petőfi, Károlyi utca 16, Budapest. The Petőfi Literary Museum is pleased to invite you to participate in the Trauma – Holocaust – Literature Conference to be held in Budapest, on November 28-29, 2014. The conference is intended as a discussion of the history of representing the Holocaust, the cultural, artistic and literary processes and the theoretical problems this representation has entailed. Our explicit goal is to bring together, in a single session, influential international authors and their Hungarian colleagues, to enable and encourage a dialogue of unprecedented vibrancy. Date et Lieu : Festival du 20 au 23 novembre 2014/ Conférence 25 et 26 novembre ) l’Université Loránd Eötvös (ELTE), Budapest. Comment décrire l’état du socialisme au cinéma avant 1989 , où le geste politique de filmer participe de l’exclusion sociale dans un vaste théâtre de la mémoire ? La question de la visualité et des archives filmiques, de la mémoire et de la contre-mémoire dans le cinéma d’Europe centrale, Russie et du Caucase. Kristian Feigelson – Sorbonne Nouvelle : Screen memories in Georgian film culture. Jasmine Jacq – University of Franche-Comté : Communist past in Russian cinema after 1991: between solemn tributes and happy desacralization ». Alex Graham – University College London : “It’s not that they died, they just forgot. Ask whoever you like”: (re)citation, textual poetics and memory systems of the Soviet intelligentsia in Aleksei German’s ‘Khrustalev, the car!’. Rainer Rother – Deutsche Kinemathek – Moments in Time 1989/90. 20 years after the peaceful revolution the Deutsche Kinemathek and the Bundeszentrale für politische Bildung published a collection of thousands of photos and hours of film shot in this critical period on the internet. These photos and films all came from privat sources. They are both records of a historical situation and documents of individual experiences. Andrea Pócsik – András Müllner – Károli Gáspár University of the Reformed Church and Eötvös Loránd University : (Re)Screening the Roma Subaltern: Post-Socialist Visuals of Roma life in Hungary under the socialist era. Mathieu Lericq – Sorbonne Nouvelle : (Post-)Communism and homosexuality — From repression to recognition: fiction and documentary cinema facing a political and social taboo. Balázs Varga – Eötvös Loránd University : Rock around the block: Postsocialist Nostalgia and Recent Eastern European Cinema. 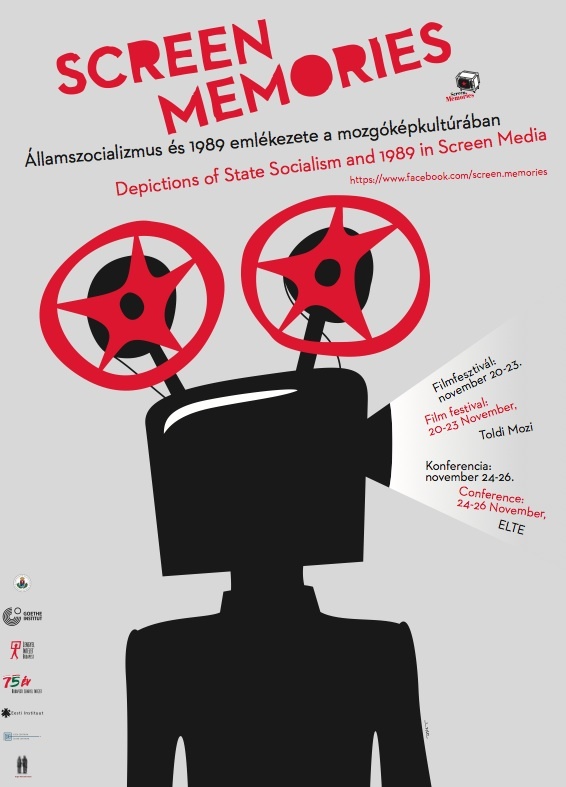 Teréz Vincze – Eötvös Loránd University : Remembering Socialist Bodies – Picturing the body in Hungarian cinema after the fall of communism. Grzegorz Wojcik – Pedagogical University of Cracow : Woman involved with Polish Newest History. Filmic Representations of Women after Political Transition in 1989. Ferenc Hammer – Eötvös Loránd University : The song remains the same: The cultural politics of socialist popular culture. Phil Mann – University of St Andrews : Doomed to repeat: The repetition of history in Viktor Oszkár Nagy’s Apaföld/Father’s Acr. Zsolt Győri – University of Debrecen White Lies, Dark Heritage: Nostalgia and the Search For (New) Illusions in Post-Socialist Hungarian Cinema. Adam Nadolny – Poznan University of Technology : Architecture and City in socialist films of the 1960s in Poland as an element of contemporary cultural discourse. László Strausz – Eötvös Loránd University : Realism and modernism in remembering – methodological observations on the new Romanian cinema. Catherine Portuges – University of Massachusetts Amherst – Retracing Holocaust Memory in Hungarian Filmmaking. This presentation engages in multigenerational dialogue Hungarian films by socialist-era directors with those of post-socialist, second- and third-generation filmmakers, rereading cinematic representations and re-imaginings of the Shoah and its sequellae 70 years on. Informed by current debates on the contested terrain of commemoration and memorialization, I suggest ways in which such re-contextualizations invite open new spaces for critical response. Extract from the following films will be screened: Géza Radványi (Somewhere in Europe/Valahol Európában, 1947); István Szabó(Father/Apa, 1966); Miklós Jancsó (Message of Stones/Kövek üzenete, 1994); Judit Elek (To Speak the Unspeakable: the Message of Elie Wiesel/Mondani a mondhatatlant: Elie Wiesel üzenete, 1996); Diana Groó (Kazinczy utca, 1999; Regina, 2013; and Livia Gyarmathy, A Tér/The Square, 2014. Mónika Dánél – Stephan Krause – Eötvös Loránd University and Centre for the History and Culture of East Central Europe : ‘Has it taken place or not?’ – Figurations of ‘Romanian’ and ‘German’ 1989. Hajnal Király – University of Lisbon : From Amnesia to Active Recalling: Representations of Memory in Contemporary Hungarian and Romanian Cinema. Katarina Misikova – Academy of Music and Dramatic Arts : A Country of Tiny History and Thick Lines?! Raluca Iacob – University of St Andrews : (n)Ostalgie of the everyday life: 1989 in post-communist cultural memory. Sanjin Pejkovic – Lund University : Re-inventing the past: Yugo-nostalgia in post-Yugoslav film memories. Ewa Mazierska – University of Central Lancashire : History and Memory of State Socialism in Polish (and other) Postcommunist Cinema. My paper will consist of two parts. In the first part I will present the official discourse on history in Poland during the period of state socialism and after 1989, trying to establish what was specific for Poland’s construction of its history and what it shared with other countries of the Eastern bloc, most importantly Czechoslovakia and Hungary. In the second part I will discuss a number of films about state socialist past belonging to different genres, such as a historical film, a documentary and a comedy, trying to establish how the use of these genres affected historical representations. Péter György – Eötvös Loránd University : The parody of Schiller’s Aesthetics through ‘The Lives of Others’. Cheryl Dueck – University of Calgary : Secret Police in Style: The Aesthetics of Remembrance. Dans le cadre du séminaire de Master et de Doctorat Sociétés communistes et post-communistes : circulations politiques et culturelles entre l’Europe « de l’Ouest » et l’Europe « de l’Est » au XXe siècle organisé par Taline Ter Minassian et Sophie Coeuré. Date et Lieu : Vendredi 7 novembre 2014 de 13h à 15h à l’Université Paris Diderot Paris 7 – Inalco, 65 rue des Grands Moulins, 75013 Paris, salle 3-12. Delphine Bechtel et Luba Jurgenson (dir. 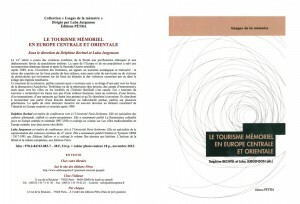 ), Le tourisme mémoriel en Europe centrale et orientale, Paris, Editions Pétra, coll. 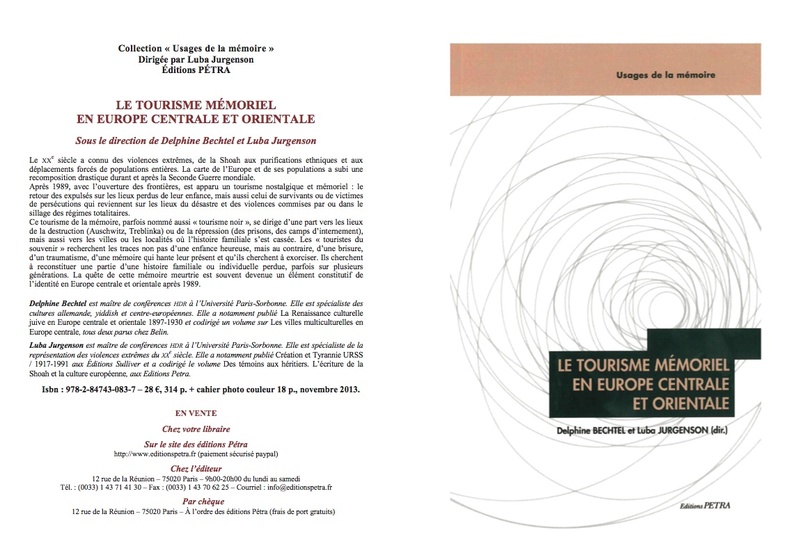 «Usages de la mémoire», 2013.